DELPHI, Ind. -- For the second year in a row, the family of Abigail Williams will be honoring her memory by filling boxes to benefit children in need this Christmas. Anna Williams said last year that the project started with family and turned into something much bigger. Each one of " Abby's Angel Boxes " will contain a Christmas surprise as well as dozens of other items that a child in need can use. Last year's goal was 200 boxes, and the project received so many donations that that exceeded that goal. Anna is still looking for businesses to volunteer to be a drop-off point for the project. If you would like to get involved you can contact her through the Abby's Angels Facebook page . 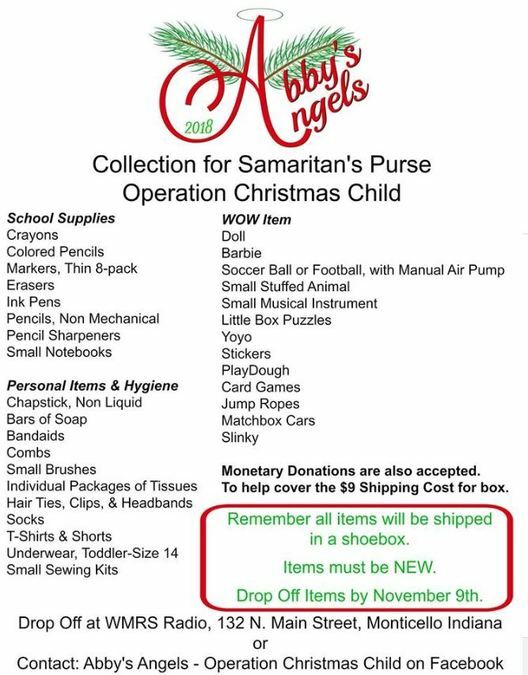 Check out the list below to find out what items you can donate to Abby's Angel Boxes. Libby and Abby went missing on February 13 while hiking along the Monon High Bridge. Their bodies were found in a wooded area on a private piece of land nearby the next morning. Eighteen months later, investigators are still trying to find their killer. Investigators are still trying to identify the man in the sketch and photo below. If you have any information call the tipline at 844-459-5786.